HP Umpire David Rackley ejected Mariners 1B Coach Chris Prieto (balk no-call; QOCY) in the top of the 9th inning of the Mariners-Rays game. With two out and one on (R1), Rays pitcher Vidal Nuno attempted to pick off Mariners baserunner R1 Jean Segura, throwing to first baseman Jake Bauers, to second baseman Christian Arroyo. Replays indicate Nuno appeared to step toward first base prior to throwing to that base (Nuno's intent of a throw to first base is indicated by the pitcher's consistent orientation toward first base and pointed toe toward first base; as stated in Rule 6.02(a)(3), "It is a balk when—The pitcher, while touching his plate, fails to step directly toward a base before throwing to that base"), the call was correct. * At the time of the ejection, the Mariners were leading, 4-3. The Mariners ultimately won the contest, 4-3. This is David Rackley (86)'s first ejection of 2018. 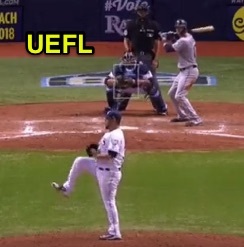 David Rackley now has 6 points in the UEFL Standings (2 Prev + 2 MLB + 2 Correct Call = 6). Crew Chief Marvin Hudson now has 1 point in Crew Division (0 Previous + 1 Correct Call = 1). *Rule 6.02(a)(3) Comment states, "Requires the pitcher, while touching his plate, to step directly toward a base before throwing to that base. If a pitcher turns or spins off of his free foot without actually stepping or if he turns his body and throws before stepping, it is a balk. because he steps. A pitcher is to step directly toward a base before throwing to that base and is required to throw (except to second base) because he steps." Furthermore, "Umpires should bear in mind that the purpose of the balk rule is to prevent the pitcher from deliberately deceiving the base runner. If there is doubt in the umpire’s mind, the 'intent' of the pitcher should govern." Related Post: Case Play 2018-2 - Balk-A-Day...Joe West? [Solved] (4/27/18). This is the 54th ejection report of the 2018 MLB regular season. This is Seattle's 3rd ejection of 2018, T-1st in the AL West (LAA, SEA 3; HOU 2; TEX 1; OAK 0). This is Chris Prieto's first career MLB ejection. This is David Rackley's first ejection since September 9, 2017 (Mike Scioscia; QOC = Y [Balls/Strikes]).